In this spirit, I submit to you, my Artistic License. 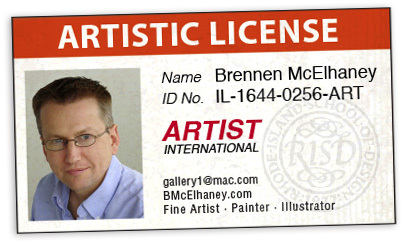 Artistic License – n. the freedom to create an artwork, musical work, or piece of writing based on the artist’s interpretation and mainly for effect; also called poetic or creative license. So where in the world does one GET and artistic license?? Think about it. No one is going to issue one to you. You have to make it yourself. You have to give yourself permission to break the rules. I’m glad to see there is no expiration date on your license. Keep up the good work Brennen – your paintings are beautiful!